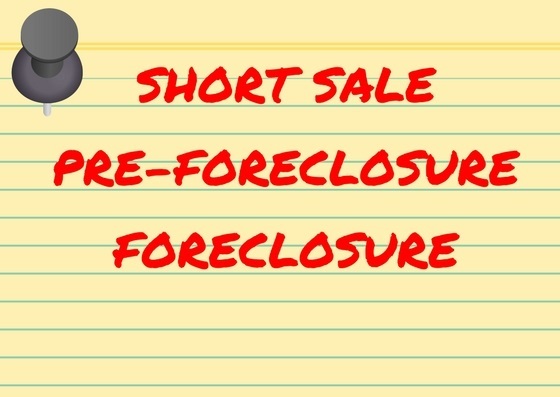 What is the difference between a short sale, pre-foreclosure, and foreclosure? If you're considering purchasing one of these kinds of properties, it's very important to understand what these terms mean and how the home's status could affect its sale. The first rule of thumb: Proceed with caution. The pitfalls for the average buyer are numerous when it comes to a short sale or a foreclosure, according to Virginia Field, a Realtor® and instructor for the National Association of Realtor®'s Short Sales and Foreclosure Resource. Let's take a look at these three distinct real estate terms and what they mean for buyers. "A short sale is when the property owner owes more on the mortgage than the market value of the property and is asking the bank to accept a short payoff of the loan," explains Cathy Baumbusch, a Realtor in Alexandria, VA.
Short sales go through a real estate agent, but they don't function exactly like your typical real estate deal. "The biggest misconception the average consumer has about buying a short sale is not realizing how long it takes," says Field. "It can take between six months to a year to close. Also, people think they are going to get a screaming deal, but they have to understand that the bank is going to try to get as much back as it can." Even more frustratingly, a seller can accept an offer on a short sale, but that doesn't guarantee that the deal is going to close. If the lender is not satisfied with the sale price, the home is not going to close. In some cases, foreclosure makes more sense for the lender because there are fewer costs associated with a foreclosure than a short sale. A home is in pre-foreclosure if a homeowner is more than 90 days late on the mortgage payments and the bank has begun the foreclosure process. "A pre-foreclosure is a property in the process of foreclosure but is still legally owned by the owner. It may or may not be a short sale," says Beverley Hourlier, a real estate agent in San Diego. Pre-foreclosure doesn't necessarily mean that the homeowner is underwater, and it doesn't guarantee that the home will be foreclosed on. In fact, says Field, if homeowners facing pre-foreclosure contact their bank, they have a chance of saving their home. "The bank doesn't want the property back," she says. "They want you to be able to save it, but you have to take action. Don't bury your head in the sand and stop opening the mail. Contact your bank right away, and they may be able to find a way to work with you," Hourlier adds. "Foreclosure means the property lender has taken back the property for lack of payment. It's a process," says Tracey Martin, a real estate agent in Salinas, CA. Buying a foreclosure is completely different from a typical home purchase. Generally, foreclosures are bought at auction sight unseen, meaning you could end up with a home in need of serious repairs. "You don't have investigatory rights; you're buying a property as is," says Field. Field also explains that experienced investors go into foreclosure auctions with cash and a formula. "For someone who just wants to buy a home to live in, it's not a smart idea," she says. But whether you're a seasoned pro or a first-time home buyer, a foreclosure can be a risky investment for anyone. Many foreclosure homes are still occupied by their former owners, whom you would be responsible for evicting. Furthermore, "if you buy, you assume all liens, IRS liens, and other mortgages possibly tied to the property," says Kevin Sucher, a real estate agent in Portland, OR. Before signing on the dotted line, do as much research about the property as possible and be prepared for surprises. Field suggests investigating websites that sell foreclosures, as they tend to have more guidance for the novice than an auctioneer at the courthouse steps. Also, when bidding on foreclosed homes, be aware that having the highest offer won't necessarily nab you the property. "Servicers will go with the buyer most likely to close. They may take a lower price from someone with better terms," Field explains. In short, unless you're shopping with cash, you might have to bid on several properties before you find a winner. "It can be done," Field says, "but it requires caution, patience, and ideally guidance from someone with experience buying foreclosures."